Quark finds himself trapped in the middle of Klingon politics after a drunken Klingon dies in his bar, apparently killed by Quark in self-defense. This story deals with the immediate aftermath of the previous three episode arc, showing how the bigger picture story trickles down to affect Quark's business and Keiko's school. It's weird seeing Gowron in a comic episode, but it works because he is the ultimate straight man. 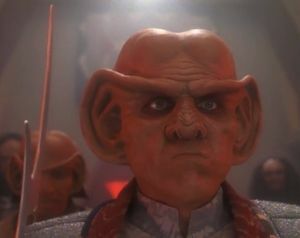 The more serious and intense he looks, the funnier Quark's antics are by comparison. Bashir giving O'Brien heartfelt--and good--advice about his marriage is a big step forward in their budding friendship. One thing the writers have handled well is putting various characters together and seeing how they interact with one another. Here, they're putting entire cultures together--the Ferengi and Klingon--and seeing how they mesh, without any human involvement whatsoever. It's facinating seeing how the two wildly different cultural personalities can find common ground. While this is a comic episode, the writers take great care in the logic of their situation. You could argue this episode is about marriage. The O'Brien B-story is a straight-forward and realistic meditation on a common marital problem--and can be touching--and the Quark A-story deals with Quark's sham marriage and the marriage of Klingon and Ferengi. The A-story is a lot of fun and a nice way to follow up the deathly serious Dominion episodes. DS9 succeeds where TNG fails by really understanding how best to utilize the Ferengi.